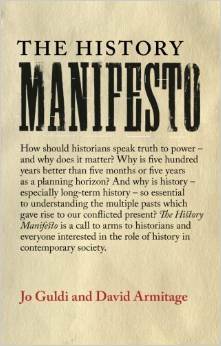 Having a personal and professional interest in what people think history is for, I read The History Manifesto with great interest. Jo Guldi (Brown) and David Armitage (Harvard) are having a “think big” moment about History, in an open access format intended for more than the usual academic audience. History ought to tell us quite a bit about the importance of Place and the necessity of Limits. I hoped that the book might give me cause for optimism about the trajectory of contemporary academic historiography. The History Manifesto offers initial promise. The authors argue that contemporary historiography suffers from a surfeit of short-term thinking, when we need more of Fernand Braudel’s longue duree. Taking the long view puts historians in a position to achieve (or possibly regain) a level of public relevance, where history serves as a “referee” that can “reestablish consensus about the actual boundaries of the possible.” (p. 87) The authors are very much interested in problems of ecology, sustainability, I am cheered. The authors decry the effects of ultra-specialization on historical writing. I applaud. There is truth to the criticism that historians know more and more about less and less. Reading history should imbue us with a sense of limits, humility, and generosity: People in the past had their narrow concerns just as we have ours. “They” were no less certain than “we,” of the necessity and sufficiency of their horizons of possibility. History likewise depends on a coherent and necessarily limited sense of community which provides the context to which our stories “stick.” Three examples: 1. Academic histories usually sell about three copies (limited audience). 2. James Michener sold many books, by contrast, but nobody makes it through all that tectonic plate business at the beginning of Alaska. Hard to identify with rocks. 3. My family has a story about my great-grandfather who, during the Great Depression, purchased a goat with money he’d intended for his church. The goat died shortly thereafter. Thereby, my family thereby ritually concludes that you should give to God what you promise to God. Besides, adding a goat makes any story better. If the authors of The History Manifesto get their way, though, Porch sitters shouldn’t expect to find academic histories that care a whit about limits, sacrality, place, groundedness in a community. The authors’ desire to turn history into a science of the future so that social engineers of all persuasions may empirically ground their claims that they know what is best for everyone else, as though naked political power weren’t working just fine already. What really irritates the authors is that economists have displaced historians as go-to Government experts, and they want historians to take back their rightful place as premier “scientific” advisers to the halls of power. University education delivers goods that are seen as commodities, as purchasable means to satisfy individual desires and solve collective problems. The knowledge it offers is a production, a techne that is a means to an end extrinsic to it. All academic disciplines in the late-modern research university have become servile arts, and the university an accidental agglomeration of advanced research competencies gathered in one facility for the sake of managerial and logistical convenience. Assumption One: History is a science. The authors immediately qualify a self-serving claim that “No historian would now seek laws in the records of the past,” arguing that “By combining the procedures and aspirations of both the humanities and the social sciences, history has a special (if not unique) claim to be a critical human science ([italics in original]: not just as a collection of narratives or a source of affirmation for the present, but a tool of reform and a means of shaping alternative futures.” (p. 15) Predictive power (i.e. “shaping alternative futures”) being a key marker of a “science,” the authors either believe history can be a science or they don’t understand the concept. Neither possibility inspires confidence. Assumption Two: The kinds of historical questions people want to know the answers to, can be answered empirically. Assumption Three: History can provide certain (i.e. “lawlike”, see Assumption One) conclusions about the past, present, and future. Historians are best placed to aggregate the “Big Data” of modern information-gathering technology because our training provides us with the skills to consider the merits and biases of various data sets. Leaving aside the fact that your average historian has the technological prowess of Noel Ludd, the last several decades of critical reflection on historical practice has concluded that the “Objectivity” project was always problematic. Add in the authors’ consistent approval of the work of Michel Foucault, and one has to conclude that either the authors have never actually read Foucault (Foucault as theorist of quantitative, predictive history doesn’t pass the laugh test), or they see the rhetoric of empirically grounded interpretation as a way to further subject knowledge to power, which shouldn’t comfort anybody. Pause, collect yourself. To make this claim, the authors’ have to ignore their own portrayal of historians as trained to consider the merits and biases of data sets. Second, if this were true, we’d be serfs already. (Due recognition to increasingly plausible arguments that this is true). Be merciful and leave aside the un-argued assumptions. Ask instead: To what ends shall we put our newfound realization that Big Data is God, and the Historian is his Prophet? Well, we should do something about climate change and global inequality. I am underwhelmed. The authors’ aim is to make history more democratic, and less a province of the ivory tower (p. 30) that everybody claims to abhor, but the problems that Matter are the ones that they want profoundly undemocratic, elite institutions to address. Any glimmer of “enough” or “limits” accompanying the inequality-talk? Nope. Any visible irony attending the simultaneous arguments that climate apocalypticists are wrong because they are teleological, but that we can understand the present and future with sufficient certainty to dismiss them? Nope. It takes a blissful absence of self-reflection to write such sentences as: “Digitisation [of data] by itself is not sufficient to break through the fog of stories and the confusion of a society divided by competing mythologies.” (p. 103) (Generous as it is to admit that there is the odd problem you can’t solve by counting stuff with computers). Or here: “The university offers a crucial space for reflection in the lives of individuals and societies. In a world of mobility, the university’s long sense of historical tradition substitutes for the long-term thinking that was the preserve of shamans, priests, and elders in another community.” (p. 105) Shucks. I thought the modern University had been instrumental in destroying our sense that anything could be sacred. But perhaps I misread. Maybe the authors meant that the University is the HQ of modern conjurer-Caesars to whom we must render a portion of our taxable income, in return for the privilege of being shown the way to the post-transcendent heaven of their choice. No, far too forthright. “So what?” you say. Arrogance in academe, “dog bites man.” Maybe, maybe not. Beware of Historians bearing Big Data. 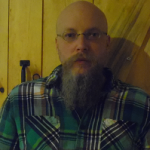 Aaron Weinacht is Professor of History at the University of Montana Western. His research interests include Russian Nihilism and Philosophy of History. His true vocation involves building custom furniture and working on the 15 acres he hopes will someday be a homestead. I am firing up my TRS-80 and filling it with data so my psychohistory calculations will tell me how to shape the End of Eternity. Bwahahahahaaa. Or, did the authors of this manifesto mean something different? Well, they don’t really mention psychohistory as an approach, but that approach to historical subject matter is pretty out of fashion these days, possibly due to sheer nuttiness among some of its practitioners, and that it tends to excessive reductionism in conclusions. However, the psychohistory with which I’m familiar definitely employed qualitative method (e.g. Freud). Since Psychology these days seems to be getting more and more quantitative in its methods, I wouldn’t be at all surprised to see fans of the Manifesto’s approach argue for a “new” psychohistory that applies contemporary judgments of empirical social psychology to the past (particularly given the authors’ esteem for Braudel’s call for the unification of the “human sciences”). So overall, I’d say it’s a “stay tuned” question. Also why I mentioned the TRS-80, an obsolete machine for an obsolete silly notion. Lifton’s book on Nazi Doctors is pretty good, but that makes your point: Lifton interviewed people who were still alive, he wasn’t psychologizing from a distance. Lloyd deMause is an example of the sort of qualitative nuttery to which I referred. I fully expect to see quantitative nuttery, in the guise of the “scientism” you mention, replace it. This is sloppy. FPR deserves better.